Legendary Marianne Faithfull is to perform live in Athens and Thessaloniki, Greece. Marianne Faithfull will perform live at the Athens’ Pallas Theater on 13 March and at the Thessaloniki’s Vellidio Congress Centre on 14 March. Her new album is expected to be released this Spring. 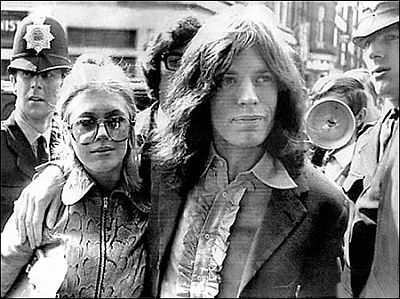 Marianne Faithfull in a picture with the Rolling Stone’s Mick Jagger, during her early music days back in the ’60’s. Cramlington indie-rock band The Longsands have been smashing up plates instead of hotel rooms as they increase their fan base in Greece. The Longsands have been playing dates with one of Greece’s biggest acts, Matisse, who have supported the likes of the Kaiser Chiefs, Garbage and Marylin Manson. The Longsands successfully released two singles in 2007, completed a UK tour, played a sell out gig at The Sage Gateshead for the launch of their second single, recorded a track for Newcastle United, and now they are looking for fresh new ways to show case their phenomenal sound to new audiences across the world. The Longsands have already had radio play on the continent and have been in contact with representatives from Sony BMG Greece who are scheduled to catch the band in Athens on the last night of the tour. “LOVE REVOLUTIONARIES – Stand up and make yourself known, I want to see each and everyone of you! We are all Brothers and Sisters in this movement of spreading the message of Love to hungry hearts and ears! 5th of March is the date when pre-sale of tickets starts for the most funky summer concert in Athens, Greece. It’s unbelievable yet true. On Friday 1st August Athens will dance to the rythms of “Are you gonna go My Way”, “American Woman”, “Let Love Rule”, “Mr. Cab Driver”, “I Belong To You”, “Fly Away”, “It Is Time For A Love Revolution” and Lenny Kravitz’s manifest will flood Lycabettus Open-Air Theater and the Athenian sky! Posted by grhomeboy in Arts Events Greece, Music Life Greek, Music Life Live Gigs. «My orchestra is the place where I keep the most personal elements of my work,» said famed English composer Michael Nyman of his Michael Nyman Band in an press interview ahead of a career-spanning performance in Athens next week. Nyman initially established a reputation through early scores for the filmmaker Peter Greenaway, such as «Drowning By Numbers» and «The Cook, the Thief, His Wife & Her Lover.» Repetitive themes played by exquisite wind instruments and violins created a totally unique atmosphere, which prompted many critics and listeners to herald Nyman as an important musical talent. His course to date has not betrayed them. The multifaceted, tireless Nyman has continued producing scores and operas; diversified for unanticipated projects with artists such as Damon Albarn of the British pop-rock group Blur; performed shows throughout the world; written commissioned work for the Venice Biennale; and exhibited photography – his other major passion. In 1993, Nyman became something of a pop star with the extraordinary popularity of his music to Jane Campion’s film «The Piano.» The soundtrack sold over 4 million copies worldwide, an enormous figure for film music standards. Nyman, on the piano, will be accompanied by a strings quartet, a brass trio, and bass for his upcoming Athens show. The composer first performed with his Michael Nyman Band back in 1976. Nyman is widely regarded as a «minimalist composer.» Strangely enough, it is a label he coined back in 1968, prior to his days as a composer, while working as a music critic on an article about the British composer Cornelius Cardew. Amid all this activity, Nyman performed his first political, anti-war project last year, a commissioned work for the BBC orchestra and choir. It is based on a poem by Jamal Juma, an exiled Iraqi living in Denmark, in which the poet expresses concern about his younger brother who is held hostage by US forces in Iraq and is considered missing. Prospective shows in coming weeks and months are breaking the silence of a subdued winter > Pivotal indie-rock act Kristin Hersh plays Athens’s Kyttaro on March 27. Sister act CocoRosie, an innovative and popular act on the indie-folk circuit, is expected at the Gagarin Club in Athens on May 16, less than a year after last summer’s well-received show. Mark Knopfler, the former frontman of chart-toppers Dire Straits, has been booked for the Lycabettus Theater on June 15. It has been one of the most subdued winter seasons in terms of imported concert activity, a stark contrast to last summer’s loaded agenda of shows – perhaps too many, considering the domestic market’s size and spending potential. A considerable number of those summer events did not fare well financially, which has probably proven detrimental to the wintertime business aspirations of local concert organizers. Some announcements, however, have trickled through for the coming weeks and months. But, come summertime, it remains to be seen whether the concert agenda will be anywhere near as densely packed as it was last year. Imminent events include performances by indie-rock icon Kristin Hersh, formerly of the Throwing Muses, Michael Nyman, best known for his emblematic soundtrack work, and the veteran act Marianne Faithfull. Bookings for spring and beyond – concertgoers should remain apprehensive of date changes or even cancellations here – include the whimsical indie-folk duo CocoRosie, preparing for a quick return to Athens after a strong show last summer, the long-running indie-rock act Dinosaur Jr, Nick Cave and the Bad Seeds, as well as Mark Knopfler, the former frontman of Dire Straits, who has put out a number of worthy solo albums since the demise of his chart-topping rock group of the late 70s and 80s. Promoters have also announced dates for three giants of the hard-rock field, the domestic market’s most reliable and consistent crowd-puller for entrepreneurs seeking a safer investment. The hard-rock parade is scheduled to begin on May 18 when Kiss, a sensation of the 70s that is still going, has been booked to perform at Terra Vibe on the outskirts of northern Athens. Then, moving well into the summer, the Karaiskaki soccer stadium in Neo Faliron, southern Athens, which is also developing into an arena-rock venue, will host a double-header with Def Leppard and Whitesnake on July 1. Iron Maiden have been booked for a show at Terra Vibe about a month later, on August 2. Hersh, who fronted the Throwing Muses, a pivotal American indie-rock act of the 80s and early 90s and has since put out a number of interesting solo albums, performs at the Kyttaro club in Athens on March 27. It rates as a definite highlight, irrespective of the sluggish concert activity here this winter. Though her former band’s work did draw a considerable following, Hersh’s debut solo effort, 1994’s “Hips and Makers”, an eerie all-acoustic effort, sold more copies than any other Throwing Muses releases, mostly because of major airplay for the song “Your Ghost” a duet featuring Hersh and REM’s Michael Stipe. Nyman, who has provided the soundtracks to films by Peter Greenaway, including 1988’s “Drowning By Numbers”, 1989’s “The Cook, the Thief, His Wife and Her Lover”, and 1991’s “Prospero’s Books” as well as Jane Campion’s “The Piano” a year later, performs at the Athens’ Badminton Theater on March 4. Faithfull returns to Athens after a number of shows over the past decade for a night at the Pallas Theater on March 13. CocoRosie, a prime act on the booming indie-folk circuit, have been slated for the Gagarin club on May 16. Nick Cave and the Bad Seeds, regular visitors here for over two decades, are expected in Athens at the open-air Lycabettus Theater on June 7, for the final night of a European tour that begins in Lisbon this April. The act, which is now set to release a new album, “Dig, Lazarus, Dig!! !” also plays Thessaloniki’s Lazariston Monastery venue a night earlier. Cave’s show in Athens will coincide with a gig at the Fuzz Club in Athens by Dinosaur Jr, a band that helped bring back the sound of raw-sounding rock guitar when it appeared to be fading – at least in mainstream music – in the 80s. Knopfler, the former Dire Straits frontman, has been booked for a night at the Lycabettus Theater on June 15. Last time he performed here was in the mid-80s, with Dire Straits when they had become international chart-toppers with the hit-laden “Brothers In Arms” album. These days, Knopfler has settled for less polish to his sound, with country-blues material dominating his song book. Knopfler recently released a new solo album, “Kill to Get Crimson” following 2006’s “All the Road Running” a collaboration with Emmylou Harris. more to follow soon, watch out this blog! Cyprus – It’s thought this show was so close to being confirmed it wasn’t funny. However, Roger’s Manager has advised us directly that this show will not now go ahead. There’s still may be a flicker of hope that the promoters will be able to find a major sponser, but at the time of writing, this show is officially dead in the water. Cyprus Latest We know that many Greek & Turkish Roger Waters fans are desperate to get information about Roger’s possible appearance in Cyprus on 9 May, so we sent our bloodhounds sniffing and here’s what they have come up with. First, Roger will NOT be performing at the Pantheon Art Cinema in Nicosia (as reported by CY Live). It appears this theatre only holds 600 people! We do know that Roger’s tour manager (Andrew Zweck) was in Cyprus at the end of January scouting for possible locations. It seems that Roger is very keen to play in the last divided city in Europe, and Nicosia’s ancient walls (in the buffer zone) was the obvious spot, but sadly that location has too many security problems that could not not be overcome. We know that Andrew Zweck then checked out the GSP stadium [ http://www.gsp.org.cy/GSP%20English.html ] in Nicosia (capacity about 22,000) and that he has approved that. However, the promoters are still seeking sponsors, and the future of this show depends on suitable sponsors being found. So at the time of writing, the best we can offer is that the show is planned, but will only go ahead if suitable sponsors are found. As soon as we get more news, you know where to find it. Roger In Cyprus A date we can’t officially confirm, but we can tell you that CY Live [ http://www.cylive.co.uk/info.php?id=3 ] have Roger listed as playing the Pantheon Art Cinema in Nicosia – Cyprus on 9 May. More news when we get it. Dazed & Confused – Pink Floyd In Cyprus Seems the media in Greece & Turkey are getting themselves somewhat confused! There’s been a flurry of stories over the last few weeks about the possibility of Pink Floyd playing there, but on closer examination it seems it’s actually Roger Waters that these stories are referring to. (Ok, we know a lot of you think Roger Waters IS Pink Floyd, but cut us some slack here please!) Now the Cyprus Mail have come out with the following screaming headline ‘Pink Floyd to play the Nicosia wall?’ The story goes on to say that the concert will take place at the Nicosia buffer zone on May 9. Before you email us, we know nothing at all about Roger performing in Greece or Turkey, but you can be assured if we do find out anything, it will appear here in a flash. It seems, that our sources have been misleading us and we apologise for it. We strongly suggest that you also monitor the news, by visiting the above mentioned link. Pink Floyd to play the Nicosia wall? Teenagers are already taking out their black logo t-shirts, while adults of all ages swoon with delight as word goes round that the creative genius of Pink Floyd, Roger Waters, and his band are likely to be arriving in Cyprus this May for a concert like no other. When rumours started circulating a few days back that they would be giving a concert on the island, no one really believed that these musical legends could possibly have reason to visit. The Pantheon Art Cinema in Nicosia then announced screenings of the cult classic, Pink Floyd: The Wall, and the rumours became rife. Although no definite confirmation can be made, it is now looking more than likely that the group will be arriving to give a concert in the Nicosia buffer zone on May 9. As one of the most successful rock bands of all time, the London boys achieved worldwide success in the 1970s with the progressive psychedelic rock of The Dark Side of the Moon, followed by the albums Wish You Were Here, Animals and The Wall. The organisers of the upcoming event are trying to make sure that details are finalised before they make any official statements. They do, however, confirm that negotiations are currently underway, and that the band should hopefully be playing on the Green Line in a show similar to the one given in Berlin in 1990, less than a year after the destruction of the Berlin Wall. Played to a live audience of 250,000 and a television audience of 500 million in 52 countries across the globe, the show took on historic proportions. Concerts in Cyprus can sometimes be very risky business and the organisers are keen to make sure that everything is done right before tickets go on sale. When you’re dealing with such a big name as Pink Floyd, the promoters can be sure that thousands will show up, but they also have to be certain that the band is happy with the choice of venue and whole concept of the show. If such a performance does take place, the one thing we can be sure of is that the ongoing division of the island will most certainly be in the limelight as foreign media will be covering the special event. Crowds can expect an extravagant show like no other. Renowned for their lavish stage shows, the rock legends will be combining their performance with video footage playing in the background. All Pink Floyd hits will be played as well as all the songs from The Dark Side of the Moon, complemented with 3D effects and laser lights. For such a small island, Cyprus really hasn’t done badly when it comes to concerts in the past few years. Crowds went mad over Elton John tickets a few years back, Sting drew in plenty of fans a couple of summers ago, and the Bryan Adams gig last June was heaving with overly excitable crowds, while 50 Cent was another surprise concert that had young fans of hip hop and R&B delighted in July. With fingers tightly crossed, it seems that things are about to get even better with a show not many would ever have imagined experiencing in the capital. It may be the concert of the year. Simply Red are coming to Cyprus, for a live concert! Saturday 7 June, at 19:oo hrs, at the Paphian Stadium, Paphos, Cyprus. Ticket prices > 99,10 euro at the door, 92,26 euro (pre sale), 128.14 euro for V.I.P. For more information call > 80 000 222 and 77 777 211.